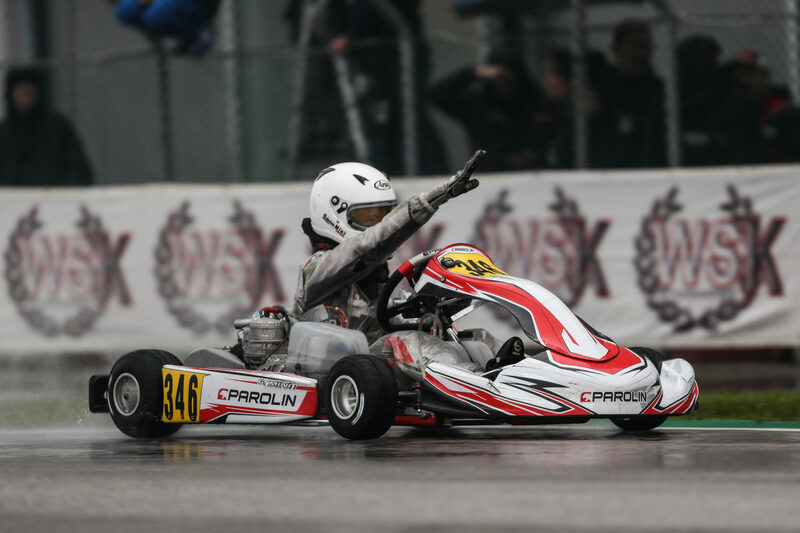 With three classes won out of four, Parolin has concluded its 2018 season on a high note last weekend on the Adria International Raceway which hosted the third and final round of the WSK Final Cup. The victories went to Gabriele Mini’ in OKJ, Andrea Rosso in OK while Joel Bergström and Kirill Kutskov finished 1-2 in 60 Mini to make the Italian manufacturer one of the strongest chassis brands of the competition. Logically expected as one of the title-contenders regarding his constantly-improving form this season, with strong results in numerous events including the WSK Super Master Series or the European and World Junior Championships, Gabriele Mini’ was faced with two eventful first rounds in this years’s Final Cup where he didn’t score as many points as he would have hoped for. At Lonato, the young Italian had recovered well from a difficult weekend when he climbed on the podium’s third step, only to be denied his result due to a post-race penalty that pushed him back to 7th overall. Bad luck hit again on the 7 Laghi Circuit of Castelletto. With two wins in the Heats and a strong 3rd on Sunday afternoon’s grid, Mini’ went in the Final with a high level of confidence that saw him lead the pack in the opening stages before losing ground on his way to 4th. But the last lap of the race brought its fair share of drama when a contact in a wheel-to-wheel battle with Taylor Barnard and Andrea Kimi Antonelli almost sent him off. If the Brit came home in sixth, Mini’ and his fellow countryman received post-race time penalties (front fairing) that both dropped them to 12th and 17th in the weekend’s rankings. So, it’s with a taste of revenge in the mouth that Gabriele entered the third and final round of the Final Cup in Adria, last weekend. And things got on a good start despite the atrocious weather conditions that would accompany the drivers until Sunday. Second-fastest of his group (E), Mini’ clinched three heats before winning one of the two Prefinals, enough to secure the Pole position for the final race in front of Barnard. If James Wharton took the lead in the first lap, Mini’ was quick to get past the Australian to keep him at bay for 2.6 seconds at the chequered flag. 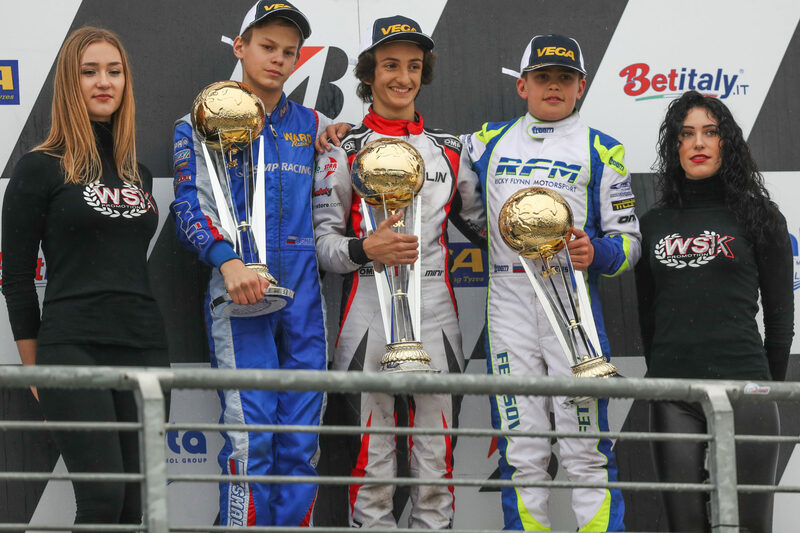 Following a string of second places at the FIA Karting World Junior Championship in Sweden, at the SKUSA SuperNationals of Las Vegas and at Lonato’s Trofeo delle Industrie, Gabriele Mini’ has finally concluded his 2018 campaign on a strong victory to promote himself to… the second place overall in the Final Cup – OKJ behind Taylor Barnard. Enough to gain full confidence heading for next season: “Happy to finish the season with a victory in the last round of WSK Final Cup and go back home with some hardware. Very happy with the work of the team and the result. Thanks to Parolin, TM Racing and my family. Now a bit of rest and looking forward to 2019!”, he shared on social media in the wake of his winning weekend. Absent in both Lonato and Castelletto, Andrea Rosso didn’t waste his first appearance in this year’s Final Cup in Adria. On Friday, the Italian driver put the Parolin chassis on Pole position in the OK class, three-tenths of a second faster than last year’s Cup winner Nicklas Nielsen. After winning his first heat on the same day, Rosso had to make do with three consecutive second-places in the Qualifying Heats on Saturday, then also in the Prefinal behind Lorenzo Travisanutto on Sunday morning. Starting from 3rd on the final grid, the events smiled upon the Parolin chassis-user as both Nielsen and Travisanutto were forced to retire because of technical complications. With his strongest rivals out, Rosso wouldn’t let the opportunity slip away and kept the first place all the way to the finish line, 1.1 seconds ahead of Kas Haverkort. A dominant result that granted the 2017 WSK Super Master Series – OKJ winner with the 6th place in this year’s Final Cup despite missing two full rounds. With more than 30 chassis users among the 85 drivers on the entry list of Adria, the 60 Mini class was once again Parolin’s playground for the third and last weekend of the WSK Final Cup. The Italian manufacturer had been building a strong momentum with a double podium at South Garda with Brando Badoer 2nd and Coskun Irfan 3rd. After missing the top-3 for a mere 0.067 seconds, Belgium’s Ean Eyckmans got the edge on Irfan at Castelletto di Branduzzo to reward the Parolin chassis with a deserved 1-2. Winner in Lonato, Jamaïca’s Alex Powell remained the one to beat heading for the Adria International Raceway. Badoer set the second-fastest lap on Friday but couldn’t turn it into a result in his first heat where he and Eyckmans had to retire while being penalized by the stewards. At the end of a busy Saturday, the Russian Maksim Orlov (two heats won) appeared as the highest Parolin representative in the provisional rankings with Mateo Rubio Luego fifth ahead of Badoer, who beautifully recovered from his early blow to win four races in a row! Despite a day with ups and downs, Joel Bergström managed to win the Prefinal B to start the category’s Final on Pole. Disputed under heavy rain, the race was certainly no “walk in the park” for the 34 youngsters. Still, Bergström put himself in control mode at the front by building a 3.2 second-gap on Kutskov. The Russian and Powell, third, were both awarded with a podium-finish as Alexandr Tibekin and his fellow countryman Alexander Gubenko were both penalized for incorrect positioning of their front fairing. Ean Eyckmans consequently finished 4th, followed further back by other Parolin-chassis drivers like Mikkel Pedersen in 7th, Rafael Modonese in 8th and Maksim Orlov in 10th. Unlike his fellow rivals, Brando Badoer was hit by drama as he finished 16th at the flag despite qualifying in third place on the grid. Thanks to a win (Castelletto) and two 4th places, Ean Eyckmans could be satisfied with his Final Cup campaign that he concluded runner-up to Alex Powell while Joel Bergström got promoted tho third place thanks to his late victory in Adria. The overall rankings of the 60 Mini class see other drivers using the Italian chassis finishing in the top ten with Brando Badoer, 4th, followed by Coskun Irfan, 5th, Kirill Kutskov 6th and Julius Dinesen, 9th. Find here the final results of the 2018 WSK Final Cup.